Basil Bunting (1900-1985) was an extraordinary if sometimes neglected poet. His late-flowering masterpiece Briggflatts (1965) jettisoned him into the pantheon of twentieth century greats and reminded his audience that the legacies of international modernism had not been entirely buried. Bunting showed that Anglo-American modernism was not incompatible with native traditions and Briggflatts is a powerful evocation of Northumbria, the poet's cherished place of origin. Such dynamic regionalism struck a powerful note in the 1960s, his poetry proving an inspiration to younger poets. Bunting became a talismanic figure, his charismatic readings helping to galvanise the British Poetry Revival. Briggflatts rescued Bunting from literary neglect and prompted readers to return to his earlier writings which are also examined here. 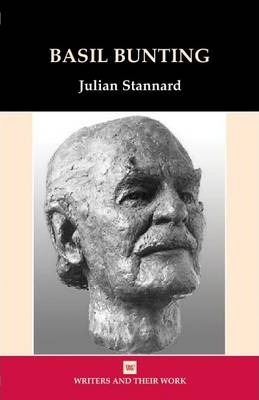 Julian Stannard is a Reader in English and Creative writing at the University of Winchester. Previous publications include Fleur Adcock in Context: From Movement to Martians (1997) and The Poetic Achievements of Donald Davie and Charles Tomlinson (2010). Also a poet, he is the author of The Parrots of Villa Gruber Discover Lapis Lazuli (2011) which completes a trilogy of poetic texts about Genoa, and a co-editor of The Palm Beach Effect; Reflections on Michael Hofmann (2013).